After reading the first three novels in Eliot Schrefer’s ape quartet (the bonobos of Endangered, chimpanzees from Threatened, and captured orangutan in Rescued) I had formed certain expectations for the final entry in the series. All three novels featured juvenile protagonists and two of them were set in Africa. I assumed Schrefer would follow a similar formula for the gorillas in Orphaned. I was right, and I was also completely wrong. Schrefer sets the story in Africa, but before any such name existed. 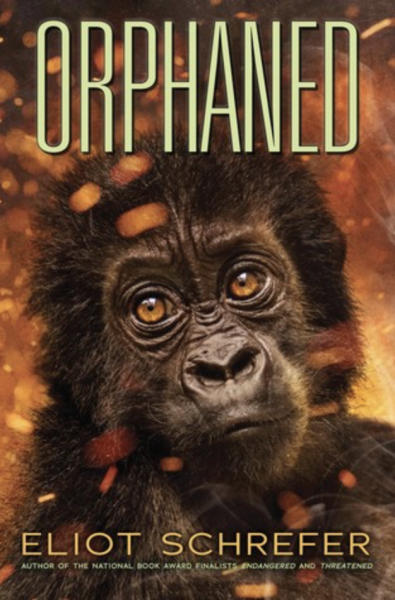 Orphaned takes place 600,000 years ago in the paleolithic era, when giant volcanic eruptions reformed the land of Central East Africa and led to the first encounters between gorillas and early humans. So yes, this is Africa, but one that was home to millions of gorillas across the continent, gorillas whose primary enemies were hippopotamus, crocodile, and lava. And Schrefer gives us the young voice I expected to guide us through this world—a protagonist every bit as vivid and courageous and sympathetic as I could have hoped—but this narrator is a gorilla. We meet Snub, a young female gorilla, before the first eruptions and just as she’s feeling unsettled with her family life. Her mother has a new baby, an “ugly pink worm” who steals the attention Snub craves. In the normal course of Snub’s life, her restless wanderings would have led her to a new family of gorillas where she would’ve had an ugly pink worm of her own. Volcanoes and homo ergaster, however, have other plans. Eruptions destroy her home and carve a path in the land for early humans to begin hunting her family. Snub is eventually left with the baby, who she renames Breath, and the two of them adopt an unlikely third orphan—a “not-gorilla” child who surprises Snub with a parade of strange habits and skills. Snub assumes her natural biological role with these unnatural children, but the bonds between her new family are soon tested on all sides. Part of the brilliance of Orphaned lies in its form. Snub’s story is told in poem, removing it from the human conventions of grammar and prose, and bending intuitively toward how a gorilla might process her world. Each poem is headed by a picture of the family unit present for that scene, from the full seven-member family of the opening down to just Snub alone at times, and these illustrations highlight the vital importance of family to gorilla life. When the header shows Snub by herself, we feel her loneliness and vulnerability in the blank space of the page. The poems are additionally woven with Snub’s vocalizations, and I found myself checking the lexicon provided at the front of the book often. Hoo acknowledges the peace of a repetitive life, acha means loving and knowing something well, and the catastrophic events of the story leave Snub desperate to regain hoo and acha for herself and her new family. Whenever a narrative is written from an animal’s point of view, some critics will immediately cry anthropomorphism. Schrefer tackles this issue with grace and precision, deliberately highlighting the similarities and differences between Snub and Orphan as the two characters become acquainted. In one such passage, the ‘not-gorilla’ dives for clams. Snub is able to recognize and translate the characteristics of humans, while retaining her own gorilla identity in a way that feels completely authentic and true to the animal. The reader understands Snub can never be human and—as we witness the tribes’ attacks on the gorillas—her quiet, peace-loving character presents as an infinitely preferable aesthetic. Anthropomorphism, in short, is the lesser path. This imagined prehistory is undeniably the crowning achievement in Schrefer’s ape quartet, at once brimming with hope and loss, love and cruelty, constantly challenging the reader to question, in six hundred thousand years, how much and how little we’ve evolved.